Helps Taking Your Medication at the Correct Time. Patients can dispense up to 24 doses per day with this device (see the filling chart below for more information). When it is time to take medication the device will alarm, prompting the patient to pull the blue handle on the tipping device. The pill dispenser is then rotated and the pills fall out into the stainless steel cup (included). This complete medication management system is ready to be used out of the box and there are no monthly fees. 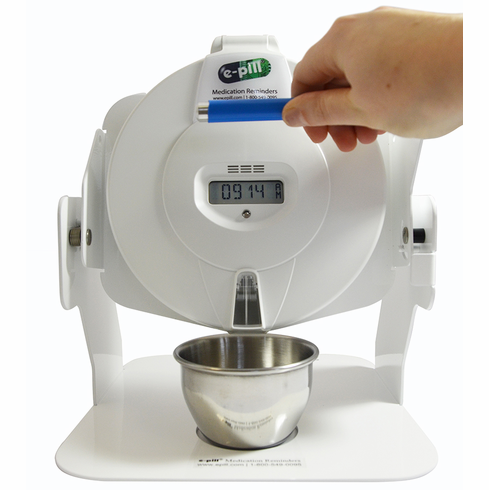 Help your loved ones avoid double-dosing with the e-pill MedTime STATION PLUS Automatic Pill Dispenser. This improved design is based on 15 years of customer experience and more than 50,000 automatic pill dispensers sold. Tipper device included for free. How-It-Works: The alarm will sound & pills will rotate into position. Pull the blue handle to turn the dispenser upside down to allow the pills to fall into your hand or a cup. All other medicine is inaccessible. The alarm will stop when the device is turned upside-down, or after 5 hours (alarm duration is user controllable from 5 minutes to 300 Minutes). Set-Up & Load: Load the pills in the medication tray. Just set the alarm clock and the times you want the dispenser to alarm every day- that's it! Each compartment has a capacity equal to 18 Aspirins. For added capacity, you may set 2 or 3 alarms for the same time and double or triple the capacity.